Every smartphone comes with a camera, and for most of us, it has completely replaced the traditional standalone camera. But what should we do if we want to edit our photos? Sure, we can find a lot of free image editing software for our computer, and a keyboard-mouse interface is an undoubtedly better way to manipulate images than a touchscreen. However, for a quick edit on the go, these are the best mobile photo editing apps. Do you use photo editing apps on your phone? In this guide, we have listed the photo editing apps in alphabetical order. Nevertheless, Adobe has undoubtedly the best photo editing software for every occasion. A few years ago, Adobe was following the trends and introduced the Adobe Photo Editor for smartphones and tablets. Nowadays, the company has an entire collection of photo editing apps for our smartphones. These apps are Photoshop Express, Photoshop Fix, Photoshop Mix, Photoshop Sketch, and Photoshop Lightroom CC. They are available for Android and iOS, and you can see in-depth details for each in this guide. 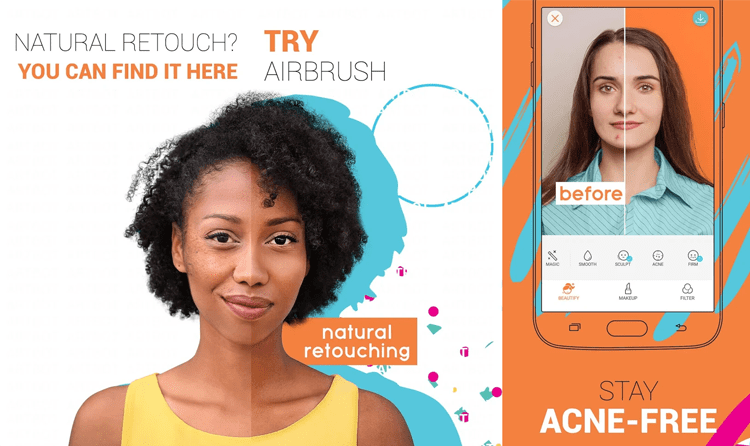 AirBrush (Android, iOS) is one of the most easy-to-use photo editing apps for our phones, and it's perfect for selfie lovers. It specializes in face retouching and editing. It helps us remove marks from our skin, whiten our teeth, change the shape of our face, and more. Additionally, on AirBrush we will find several filters to make our photos more interesting. Some of the tools are reserved for users of the paid edition, but we can also access them by watching an ad. Fotor is a well-known image editing website. The Fotor Photo Editor (Android, iOS) app brings the website's tools to our phone. There is a reason why we will find Fotor in almost every list of photo editing apps. All of its tools are remarkable and offer the ability to enhance photos in one touch. Some of Fotor's tools let us cut, rotate, and resize an image. It also has tools which allow us to change the brightness, contrast, exposure, color, temperature, and more. The app also has over 100 filters to choose from. The only negative aspect of Fotor is the relatively expensive premium items. Google Photos (Android, iOS) is Google's image management app. However, it is also one of the simplest photo editing apps we will find on the market. We shouldn't set our expectations too high since it's not the most powerful app out there. 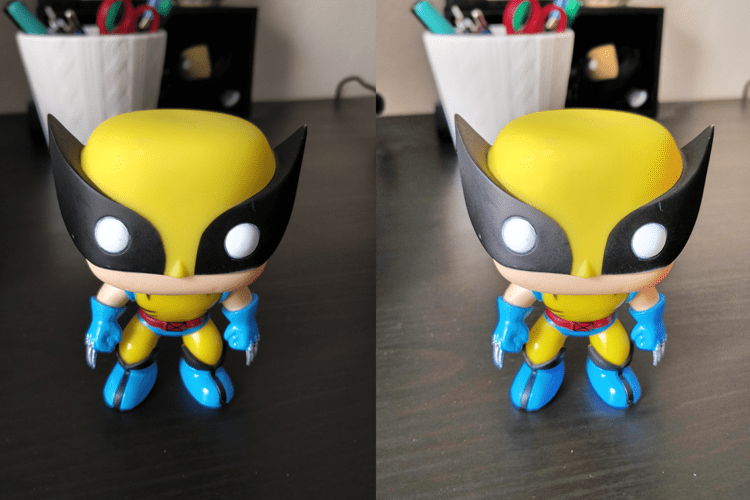 In Google Photos we can rotate images, add filters, and do some basic color editing. 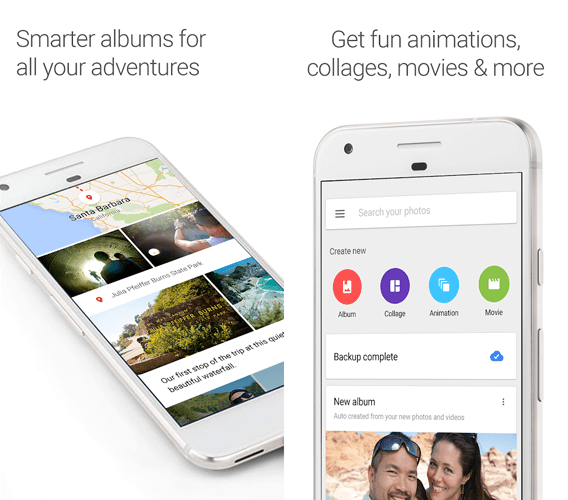 Moreover, with Google Photos Assistant, we can create collages, image albums, GIFs, and even videos. 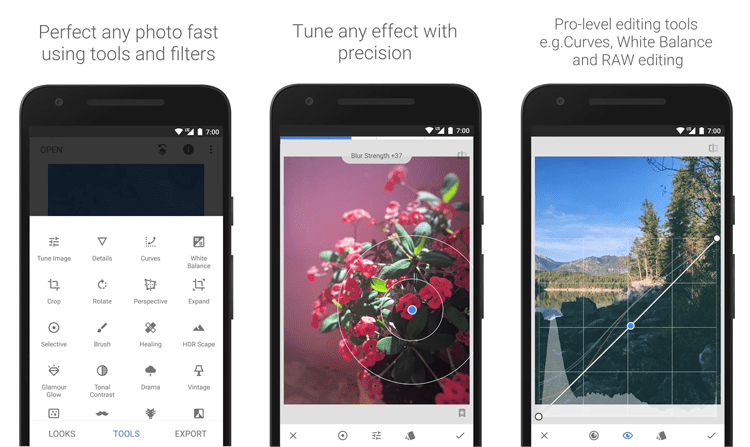 One of Google's photo editing apps is Snapseed (Android, iOS), and it's nothing like Google Photos. Snapseed is one of the most powerful photo editing apps. It supports RAW images, it has a vast collection of tools and filters, and we can precisely tweak most of them. Snapseed's environment is simple and easy to use. It's the biggest competitor of Adobe's apps, and if the list weren't alphabetical, it would take the second place. Read our guide about everything you need to know about Google Photos. LightX Photo Editor was out for iOS way before Android users even knew its existence. But the day finally came, and everyone can enjoy it. LightX Photo Editor takes the photo editing apps to the next level. It's not our typical app with which we can add simple filters, make automatic fixes, and so on. With LightX Photo Editor, we can also change the background of an image, or add new objects to it. We can create collages, add frames, edit the colors of a photo, and more. If we don't want to have numerous applications on our phone, then LightX Photo Editor is our the best option. PhotoDirector (Android, iOS) belongs to the powerful photo editing apps category. It has a relatively simple user interface and a good collection of tools. 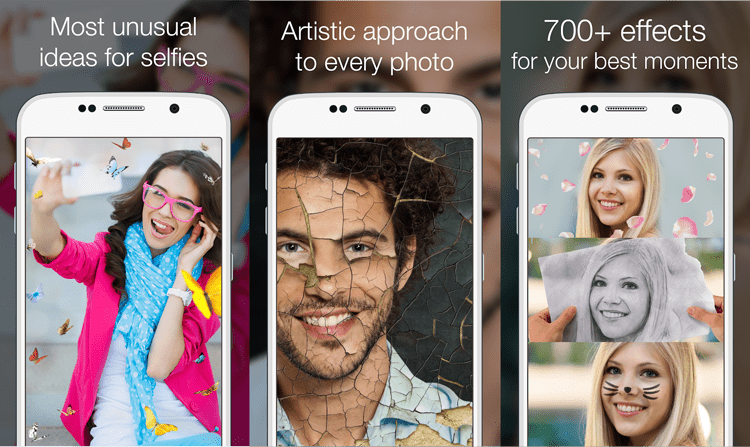 It's an app for those who want more than just Instagram filters. PhotoDirector focuses on manual photo editing, allowing us to edit the image's color, and use HSL controllers and RGB color channels. Furthermore, in PhotoDirector we will find settings for white balance, brightness, darkness, contrast, exposure, and much more. Most people who edit their photos on their phone have probably heard of the well-known Photo Editor by Aviary (Android, iOS) app. Like most photo editing apps, it comes with features such as one-touch fix, filters, stickers, and teeth whitening. However, in Aviary's Photo Editor, among other things, we can adjust the color and the contrast of the picture. Photo Effects Pro (Android) is made for those who like to use filters, effects, stickers, and more. Its collection consists of over 40 filters and effects. Moreover, we can add text to our photos, stickers, frames, or draw on them with our finger. Also, Photo Effect Pro includes a small collection of photo editing tools. One of the not so well-known photo editing apps is Photo Lab (Android, iOS). The free version (Android, iOS) offers considerably fewer features. It also has ads and adds a watermark to our images. Nevertheless, the annual subscription costs $9.99, and it's worth our every penny. At Photo Lab, we will find over 640 filters, effects, and frames that will make our photos unique. Additionally, we can create a photo collage, change the lighting, and apply various effects. 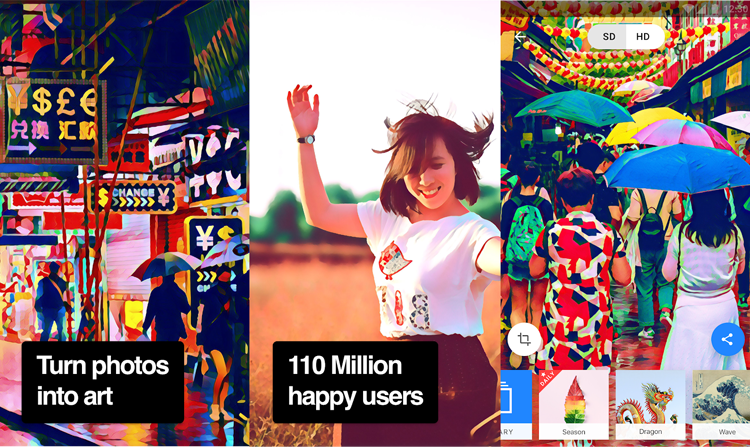 PicsArt Photo Studio (Android, iOS) is an old app with over 250 million downloads. Its creators are still updating the app in an effort to stay relevant. 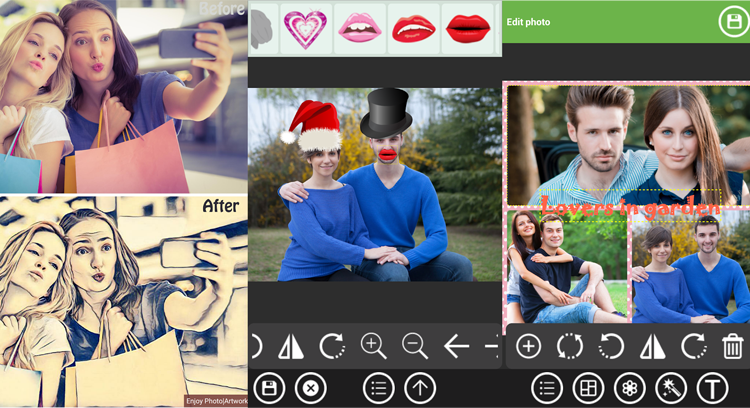 At PicsArt Photo Studio we will find several useful tools, such as filters, stickers, text, and collages. It has more than 100 tools, and it allows us to share our creations with our friends. 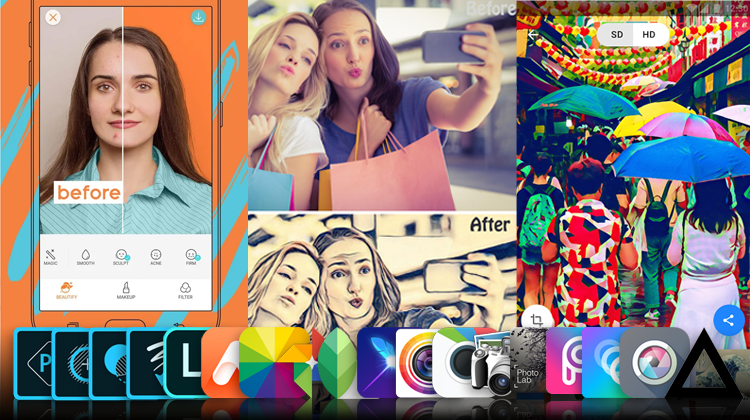 PicsArt has several photo editing apps, but the most impressive is PicsArt Animator: GIF & Video (Android, iOS). This app allows us to convert simple images to GIF. Once known as Pixlr Express, Pixlr (Android, iOS) also belongs to the powerful photo editing apps category. Pixlr has one of the best one-touch image enhancement tools. It also has a great set of features and tools. Among others, it offers filters, tools for removing imperfections, and tooth whitening. Read the presentation of the web version of Pixlr, which is as great for everyday use as Adobe Photoshop. Filters that convert simple pictures to paintings don't get much love among most users. Prisma (Android, iOS) has come to show us that this procedure, when done correctly, can offer a good result. Prisma's Photo Editor strength is its filters, and they are over 800. 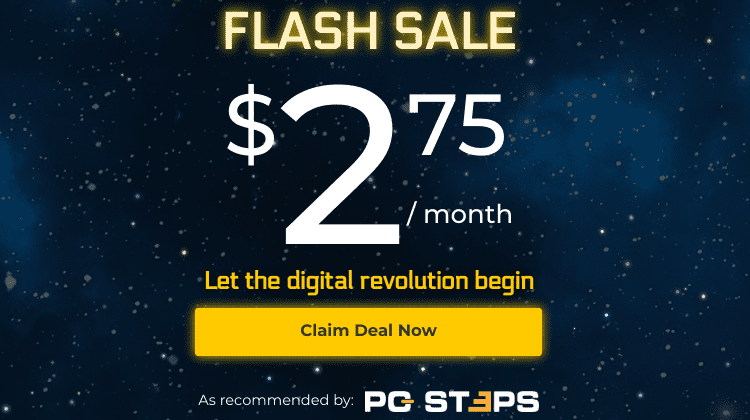 Most of them are free, but we can get the annual subscription for $18.99. With it, we unlock all the filters and HD processing. Additionally, Prisma has an in-app feed, similar to Instagram's. We can publish our creations and share them with other users. It would take us a while to find the perfect app to edit our images. We now have a wide variety, each app has various features, and we can find the best one for us. Do you edit your photos on your mobile? Or do you prefer the comfort of your computer? Have you tried any of these photo editing apps or one that we didn't mention? Write us in the comments.